The Americans have need of the telephone, but we do not. We have plenty of messenger boys. — Sir William Preece, chief engineer of the British Post Office, 1876. The telephone didn’t get off to a roaring start. Western Union turned it down. They were perfectly content with their telegraph. And as the quote above shows, the British weren’t very impressed either. If you think about it, the telephone had a bit of a chicken and egg problem. Why get a phone if none of your friends have phones? But, your friends won’t get a phone if you don’t have one. Of course, eventually the telphone caught on and today Who Doesn’t Have A Cell Phone? I was working for Microsoft. This meant that my mother’s CPA firm had a built in source for software and support. I didn’t always advise she upgrade. (Breaking Out Of The Upgrade Cycle.) 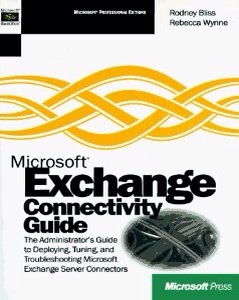 My speciality was Microsoft Exchange. And much to my chagrin, my mother’s office didn’t have email. This was about 1998. The internet was just starting to get it’s sea legs. Mom, you should let me install Microsoft Exchange email for your office. Why would we even want that? Well, you can schedule client appointments in the Scheduler program and avoid conflicts. Everyone maintains their own schedule and has a office. We don’t really have conflicts. Well, you can send messages. And if you aren’t here to get the message it will go to your inbox and you can read it the next time you come in. We don’t need that. 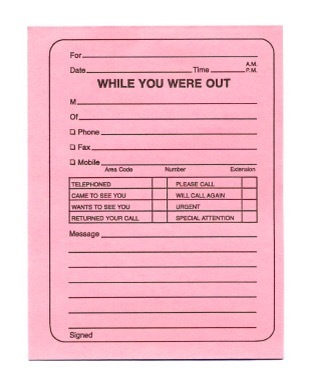 We have plenty of pink Message slips. How do you argue with logic like that? The secretary would take messages and then tape the pink messages slips to people’s office door. Ironically, my mother’s firm was one of the more aggressive at adopting technology. She had a network very early on. She saw the advantage of centralized storage. Her firm was one of the first in the small town of Olympia, WA to go completely digital. Everything went into the computer. The network let every accountant have access to all the records. Later, she was one of the first to push her clients to file electronically. But, how to convince her that she really needed a tool that she didn’t think she wanted? Tell you what, Mom. You’re tired of me hounding you about email. Here’s a deal. You let me setup an Exchange server and put all your accountants on it and if they don’t like it after a month, I’ll come take it out and not bug you about it again. Well, I’m sure you know how that conversation went a month later. It’s been 30 days. Did you want me to remove the Exchange server? If you do, the staff threatened to quit. I can’t take great credit as a salesman. The software was free. I cannot imagine how much more difficult the conversation would have been had I asked her to pay several thousand dollars to test my deal.